The suspense is killing me. A week ago my front yard was one gigantic skating rink, the ice smooth as glass. It’s so tempting, but if I step onto the ice before it’s ready, I will be in for the swim of my life. Thanks for clearing up the ambiguities, Mr. DNR. This morning the temperature was -17, plenty cold for “spontaneous nucleation,” and all the other chemical reactions scientists say have to take place for lake ice to properly form. It looks solid. 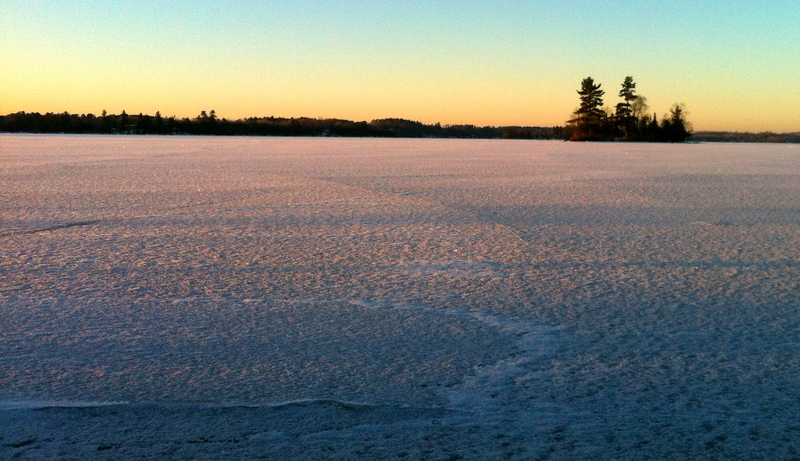 And there’s even a thin layer of snow, making the lake almost perfect for skate skiing. But what day do I finally take that leap of faith, click into my skis, and start gliding? Your guess is as good as mine. I’ve been thinking the same thing, but I love skate skiing, too. I don’t know if it is something that happens as you get older, or if it is just me; but, I used to cross-country ski a lot. I live just east of St Paul and there are some great areas to ski in over here (Afton State Park, Lake Elmo Park Reserve, and Sunfish Park in Lake Elmo, to name three), but cold just gets to me now and I find myself embracing indoor activities in the winter. Maybe that’s why I suggested warmer climates over wondering if the ice is safe. Thank you very much. That’s nice to hear. Go skiing! With this warm stretch of weather here in the cities, we now have no snow to ski on! I’m assuming you are up north somewhere, how is the snow cover where you are? Thanks for your kind words. They are encouraging!